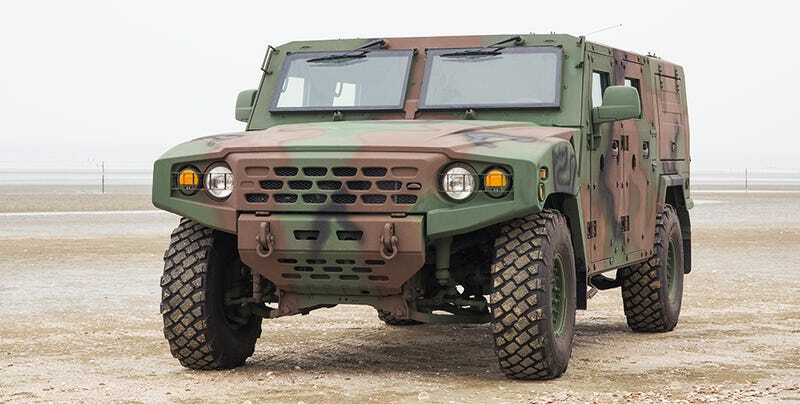 The third generation of Kia Military vehicles are hitting the market! The Kia Light Tactical Vehicle (K LTV) has an 8-speed auto, AWD, and a 225 hp / 369 lb-ft turbo-diesel V6 engine that meets EURO 5 emissions requirements (no clue on what the perimeters on that are). But for me, it’s this 420 hp / 1446 lb-ft, 10-liter diesel, 6x6 Kia Medium Tactical Vehicle (K MTV) that I’m pretty jazzed for. Also meets EURO 5 emissions requirements. When I say new military vehicles I mean as in the LTV just started production in 2016. That MTV above is coming out and has already received a bump from the claimed 380 hp to that 420 hp mark. All vehicles will have modular setups of course including (in the case of the MTV) 4x4, 6x6, and 8x8 versions. Excitement! Mostly because this gives Kia more parts durability and quality applications. Right now the consumer cars are benchmarked to an 8 year durability track (that includes things such as rubber and plastics having a resistance to drying out or cracking). However, these military vehicles are bumping that up to a 15 to 20 year durability mark and will be using quite of few parts from the commercially available vehicles. There is also some work being done to hybridize this all new turbo-diesel 4x4 powertrain in the LTV, so I’ll keep you all posted if I find anything else about that.